It's just past rush hour, and my husband, Nelson, and I are riding the Red Line T into Boston. I'm finally feeling morning sickness (at all times of the day, in fact) so I'm trying extra hard to keep the queasiness at bay while we squish in next to a crowd of people. I catch a whiff of strong jasmine perfume from a heavy set lady dressed in a red flowing tunic and fight off the heaving sensation in my belly. I close my eyes, breath slowly, and listen to the sound of the trolley car now ricocheting along the tracks. The steady rhythm centers me, and I start to think about the tiny heart beat that I hope we'll see at our first ultrasound today. The ancient Egyptians believed that the heart was the center of one's being. This seems utterly true to me as someone who has experienced pregnancy five times now. With both miscarriages, I was told that the embryo probably never developed. There was never a heartbeat. Consequently, I've anticipated the first attempt to find a heartbeat during each pregnancy with desperate trepidation. I've been told that once the heartbeat is detected, your chance of miscarriage drops substantially. Even though an entire baby is still being engineered inside the womb, and it seems there are countless things that could go wrong, it's the simple act of a beating heart that signifies the initial viability of your baby's life. Even though I'm feeling more reassured about this pregnancy since my morning sickness arrived a few days ago, I'm still nervous. As our train gets closer to our stop, my own heart is beating a little quicker. When we finally arrive for the ultrasound, I'm feeling faint and sweaty. But I hold onto my composure and feel better when we meet our very nice ultrasound technician. The moment of truth is here. The warm blue gel is on my belly. I'm surprised that the technician will attempt an external ultrasound, but she explains that with a full bladder, she will hopefully be able to see something. In a few moments she points out the sac and then the embryo. She zooms in and there it is. 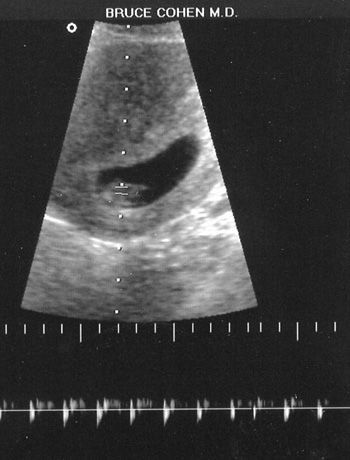 It's no bigger than a pin drop, but there inside this tiny lentil bean of a baby is the discernable blip, blip, blip of a beating heart. I'm so relieved and elated, and relax my body and enjoy the rest of the ultrasound as the technician takes measurements and estimates my due date. Once the ultrasound is over, Nelson and I share a kiss. He's relieved too. We decide to head into the North End to share a pizza, which sounds surprisingly good despite my finicky stomach. As we ride along in the T again, I allow myself to fully enjoy this morning's good news. I replay the ultrasound moment over in my mind again. And then I have an awful thought. What if I have a miscarriage anyway? What if the heart stops beating? I understand more fully what those ancient Egyptians were saying. My baby is suddenly a real living being, with a real beating heart. Now I really have something to lose. If the heart is the center of one's being, my being beats with wild love for my two daughters and the little blip, blip, blip now pulsing inside of me.